One of the most important jobs you have during the swimming pool season is to test the water. Without the proper water chemistry, you could encounter may problems with your swimming pool water. Today, there are so many different ways to test the swimming pool, there are drops, test strips and even digital water testing is available. If you are a new pool owner or you want to try a different method of testing the swimming pool water we can offer you the Best Swimming Pool Test Kits and Test Strips. We will profile the top 5 water testing methods. These methods will include the Aqua Chek Pool & Spa Test Strips, GLB 4 Way Test Strips, Aqua Chek Pro Service Kit, the HTH Two Way OTO Pool Test Kit and the Taylor Pool Water Test Kit. Let’s take a look and see what each testing kit has to offer and which one will work best for you. Test Strips are the tried and true method of testing swimming pool water. The concept and execution are simple, remove one of the strips from the container and dip the test strips into the spa or pool water and remove quickly. Count out about 15 seconds and then look at your results. There is a color coded result chart on the side of the bottle. Compare the test strip results to the bottle and get your results. Now you will know which levels are good, high or low. You can now make the necessary adjustments to your water chemistry to make sure that all levels are good next time. On these strips you will get 4 tests and 25 strips come in one bottle. The directions are easy to follow and the test results are easy to read. You can buy these Aqua Chek Test Strips at your local Sam’s Club location. These strips are affordably priced at $12.88. Once you start testing on a weekly basis, it will be easier to keep your water chemistry level. You will save money on chemicals as well as save time putting in these chemicals. GLB 4 Way Test Strips are compatible with swimming pools and spas. 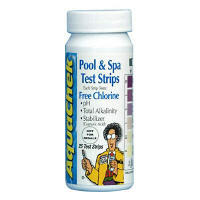 These strips will help figure out levels of pH, total alkalinity and chlorine/bromine. Like the Aqua Check Testing Method we previously mentioned, the GLB 4 Way Test Strips have a color coded result chart on the side of the bottle. GLB has a great reputation with swimming pool and spa products that the test strips would be a welcome addition. The GLB test strips comes in a flip open bottle that makes removing the test strips easy. With the GLB 4 Way Test Strips you don’t need any messy or dripping drops or solutions everywhere. You will get a good clean test every time. Simply dip the test strip in the water and wait about 20 seconds. Then read the results, you can start comparing them to chart after the 20 seconds. With the GLB Testing Strips you will get more accurate testing than ever before. You will know how to add the proper amount of chemicals to the pool or spa with the use of GLB 4 Way Test Strips. These testing strips costs about $10.86. The Aqua Chek Pro Service Kit is a kit that is great for the service professional or the pool owner who is dedicated to making sure that their swimming pool is taken care of properly. This is one of the largest testing kits in the industry. This kit will test for 16 different water chemistry chemicals. You will get the FAS-DPD titration kit included and a total chlorine test that is used on public swimming pools. Included in this kit are the AquaTrend Phosphate Test, the Aqua Chek Silver 7 Way, the Pro 5 Way Copper and Borate test and a test for Sodium Chloride just to name a few. You will get the Professional service Kit Manual with a treatment card. Everything you need and more is included with this kit. Your swimming pool could have perfect levels when you test the swimming pool and spa with the Aqua Chek Pro Service Kit. This kit costs about $ 104.99 but when you see that your water levels are even you will not need as many chemicals and you will save money right away. The HTH Two Way OTO Pool Test Kit is from the most popular name in the swimming pool chemical industry. Not only do they have extensive inventory of chemicals and accessories for your swimming pool and spa but also they have top of the line testing kits. The Two Way OTO Pool Test Kit offers testing for Chlorine, Bromine and pH. With this testing kit you can now have the perfect water chemistry at all times. The hardest problem pool owners seem to have is that they have trouble keeping the water chemistry right. Some pool owners add to much and others add too little but with the HTH Two Way OTO Pool Testing Kit you can get an accurate reading every time. This will save you money on chemicals throughout the season. There are 100 tests in the kit. This kit costs about $ 5.25 depending on where you shop. With the Taylor Complete Test comes with high range test kit with liquid solution for free and total chlorine, pH and bromine. You will be able to test for acid demand, total alkalinity, calcium hardness and cyanic acids. With this kit you will get a Booklet, instructions, expandable series case and the testing kit. The kit comes with the chart and the drops for each chemical test that you need. Now you can have perfect water chemistry all the time. Simply fill up the tester with water and apply the correct amount of the corresponding drops. The shake the tester and you will get an accurate reading. Read all of the directions on how many drops and when the readings should be taken. To get an accurate reading make sure that you read the directions carefully and you could save a lot of money on chemicals and you won’t be swimming in chemicals that don’t need to be in your swimming pool. The Taylor Complete Testing Kit costs $41.49. Water testing kits are necessary to ensure a healthy swimming pool. 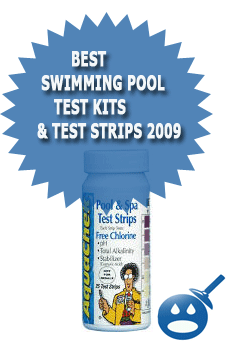 Without these testing kits you would not know how much chlorine to add to your pool or if you have too much pH. There are so many different styles of kits out there. But with the best swimming pool test kits of 2009, we hope we have made it easier for you to narrow down the kind of kits that you want. The cheapest doesn’t necessarily mean that the product isn’t the best. The names we profiled like Aqua Chek, HTH and GLB are some of the most popular names in the industry. Check out their products and see what their tests include and if would be a good fit for you. There should be an (s) after “test” in the last paragraph. Thank you! Good Catch, We Appreciate the feedback! This seems mostly like advertising rather than a review. I recently purchased all new testing equipment, since it seemed my pH readings were off. I purchased 3 different types of pH testers. One liquid tester (Pentair) and 2 dip test kits – by Pool Check and HACH (Aquacheck 7). The readings were 1 full point off between the dip sticks (which had 2 different colors of pH readings) and the liquid on 2 different pool run multiple times across a week. So – which one is correct? How do I adjust my pH to keep it in the narrow bounds my system requires when the tests disagree? Thanks. Great question! Taking your issue one step further, I have 3 pool stores in the area that provide pool water testing. I took a water sample to each of the 3 stores. The samples were drawn at the same time and taken to the stores within 1.5 hours of eachother. One told be to lower my Ph, another to raise it. As much as you hear about the importance of properly balancing your pool water, I’ve decided to that it the professionals can’t agree, I needn’t be so uptight about it. I enjoy my pool much more now. You can use PH up or down to adjust the PH in your pool. Oh yea, You will also need to vacuum and bask wash the filter once a week, even if it looks clear. Are you talking color blind or totally blind? Have you ever tried something called “AquaCheck” strips? They work with strips and not reactant.. There is something called “dechlor”. This will bring down the chlorine in your pool. Here is a picture of the dechlor as well. We purchased our first pool 2 weeks ago and I am so confused on what to do about the chemical situation. I called the place where we got it and he said you need to read your manual. OK who reads those things? I tried but it didn’t tell me what I needed to know. I have low chlorine and I purchased a floaty thing that has tablets in it so what else do I have to do to get that up? PH is high and I put PH down in it. Do I need to keep putting that in until it’s at the right level? I thought 1 bottle would have been enough. The total alkalinity is high also. I don’t even know what to put in for that at all. I noticed you said something about baking soda, I have never heard of anyone doing that. Cyanuric acid is low also; what is that? Help please. Sounds like you have “Black Algae”. You will need to get some Black Algae out to remove the Algae and you will also have to scrub the pool walls. The Taylor K-2006 is my preferred pool test kit due to it’s FAS-DPD Free and Combined Chlorine test. Unlike other tests, the FAS-DPD does not force you to rely on judging the color. You count drops until your test tube becomes totally clear. Also, with the Taylor K-2006, you can test very small levels of chlorine (.2) up to very large (20PPM or more). I am purchasing a pool for the upcoming summer. I am totally blind and would like to handle most of the upkeep. Are there any audio devices on the market that could help me? Thanks.